Please note that Thursday, December 5th is the last day we are able to ensure delivery by December 24th. Mahalo! Read about us in the best magazine in the islands, Hana Hou!! A place in time where you might have been before and now you are. Destiny illuminates the path you travel and fuels your dreams. An elegant hairbrush, functional art to use everyday- handcrafted by people who care, out of the finest figured wood, a totally unique creation- a brush with destiny. Our hairbrushes are handcrafted with care and attention on the windward coast of the Island of Hawaiʻi by our family and friends, our ʻohana. 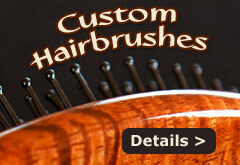 See our full line of products, including hairsticks, our Artisan’s choice offerings and replacement hairbrush heads. If you are in the Hawaiian Islands and would like hold a brush in your hand, a number of fine galleries carry them.